Emphasize your department’s safety commitment with this effective traffic calming tool in response to civilian complaints or in locations where a speed reminder is adequate to slow down motorists. Combining a 2- or 2½-digit radar speed display and two 6-character lines give the PMMD a presence hard to ignore. It’s water-resistant and operates in temperatures from ± -20° to 120° F (-29° to 48° C). The Stalker PMMD can be placed in virtually any location and perform reliably in any weather. A configurable timer controls which message is displayed and when it’s displayed. The sign’s light intensity adjusts to ambient light conditions. Activate the Stalker Traffic Analyst and deploy a PMMD in a problem area. Get a real picture of traffic conditions and collect traffic data supporting your next Grant request. The statistics option allows the Pole Mounted Display to collect traffic statistics while providing speed information to drivers. It can also be run with the sign off. critical timeframes for more exact data and results. Almost unlimited data can be collected. The data is stored in a removable USB thumb drive hidden inside the locked access door at the bottom of the sign. The PMMD is capable of pairing with a tablet or computer for easy programming. 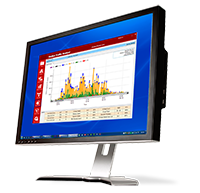 Using Stalker’s PMD Wizard, all timers, alerts, speeds, messages, and optional statistics can be set from within an intuitive, user-friendly interface. Complicated programming for up to a full year can be accomplished from within the Wizard. The wireless function only requires that the tablet or computer be paired with the sign and be using the Stalker PMD Wizard user interface. Alternatively, the included infrared remote control can also configure the PMD. It is conveniently stowed in the underside of the sign in a locked access compartment. The speed display’s remote control and removable flash drive are conveniently stored inside the unit. No more searching for the remote control. It stays with the PMMD. 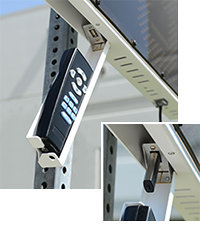 A rugged, 2-piece mounting bracket is standard on all PMMD units. 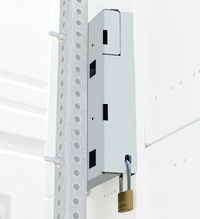 The bracket makes for easy installation and gives added security for maximum equipment retention. The PMMD supports five independent timers which configure the sign to perform particular functions only during times selected. The timers are controlled by an internal real time clock that allows each timer’s start and stop time to be set on any date and at any time. Message Sign: 5" x 3"
Configuration Fully configurable with dedicated RS-232 port.